Screencasts are short, simple instructor-created narrations designed to provide supplemental learning for students to use outside class. We learned more about screencasting in the latest Pedagogical Innovations Journal Club held on February 24, 2015 where we discussed the article “Impact of Screencast Technology: Connecting the Perception of Usefulness and the Reality of Performance” by Katie Green and colleagues published in the Journal of Engineering Education. 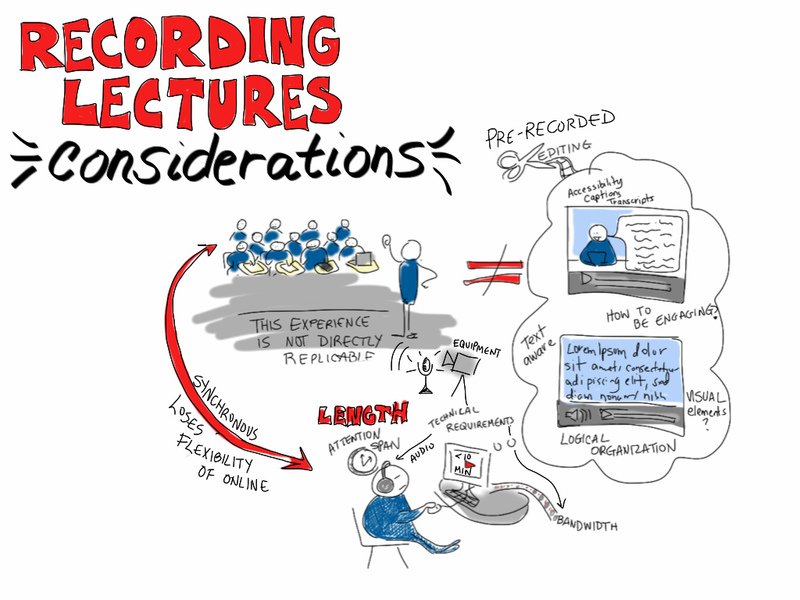 How might screencasts impact learning? The article describes a study that examines the benefits of screencasts designed to supplement lectures and clarify difficult course concepts. The authors report that students who did regularly view screencasts performed better on exams. Furthermore the use of screencasts correlated with student-reported self-efficacy. Those who did not use screencasts because they did not have time, or were unable to find the screencast, or had technical problems: This group of students performed, overall, worse than their classmates who viewed the screencasts. Those students who didn’t use the screencasts because they didn’t feel they needed additional assistance: This group performed as well as students who did use the screencasting. How long should screencasts be? The article described two different types of screencasts: Homework solutions which ranged from 10 – 15 minutes and mini-lectures which ranged from 5 – 8 minutes. The mini-lectures were viewed more often than the homework solutions and the authors speculated that it may be because they were shorter in length. There was a general agreement in our discussion group that instructors should aim for shorter, rather than longer screencasts. Camtasia Relay is free, easy for a beginner to use, and supported by a number of institutions. This UMinn URL provides basic information about Camtasia from IT@UMN http://it.umn.edu/using-camtasia-relay-client. Jing is free software that is also easy to use, with more information about Jing available at this URL: http://www.techsmith.com/jing.html. How do I identify topics? The article and the experience of some of the participants led to a list of several different approaches for identifying screencasting topics. In-class clicker question performance. Instructors who already use in-class clicker questions, might opt to create a mini-presentation screencast to expand on a question that a significant percentage of students answered incorrectly. If the majority of students miss a question, you would probably want to go over the answer in class, however if only 25% of students miss it, a screencast is a way to provide additional assistance to that 25% without taking valuable class time for something the majority understood. Exam or quiz performance: Student performance on exams and quizzes will likely identify areas where students are having problems. One or more of these topics is a good source for screencast material that students can review independently. Muddiest point from class: At the end of each class session you can ask students to take a minute to write down their muddiest point from the class and collect these. If multiple students are muddy on the same issue, a screencast on that issue could be helpful to them (and other students). List of topics at the end of each class: Some instructors create a short handout that lists the 3 – 4 main topics addressed in class for the day and ask students to circle one (or more) troublesome topics. The most-circled topics are good sources of screencast topics. From UC-Boulder “Effective Screencasting FAQ” resource page. Screencasts can be relatively easy for instructors to create and can be used again in subsequent semesters. Students appreciate them. This may improve student attitudes about the subject, the course, and your teaching. Students with more to learn in a course benefit from them without “holding back” students with less to learn. Because they are optional and viewed offline, students who don’t need the extra help can choose not to watch them. Instructors can point to data to encourage students to use them. Articles like the one discussed here can be referenced to convince students of the utility of viewing screencasts. There was a discussion about the validity of the study design used in the article. It was pointed out that there was no control or baseline group to compare the students who had screencasts to – whether a group of recent or current students who did not have access to screencasts. Without this sort of baseline comparison, another interpretation of this data is that students who are most conscientious and/or are already likely to score the highest grades in the course are the ones who will watch the screencasts.